Vous souhaitez poser une question à l'établissement Phitsanulok Orchid Hotel ? Niché en plein Hua Ro, le Phitsanulok Orchid Hotel est idéal pour partir à la découverte de Phitsanulok. De là, les clients peuvent facilement se déplacer et profiter de tous les avantages offerts par cette ville dynamique. Entretien impeccable et proximité avec Musée populaire du Sgt. Maj. Thavee, Palais Chan, Sanctuaire Somdej Phra Naresuan Maharat confèrent à cet établissement un charme unique. À travers ses services de qualité et un vaste éventail d'équipements, le Phitsanulok Orchid Hotel s'attache à rendre votre séjour aussi agréable que possible. L'établissement donne accès à un vaste éventail de services, dont service en chambre 24h/24, WiFi gratuit dans toutes les chambres, WiFi dans les espaces communs, service de voiturier, parking, pour n'en citer que quelques-uns. L'hôtel compte 56 chambres superbement aménagées : nombre d'entre elles sont dotées de télévision écran plat, internet sans fil (gratuit), chambres non-fumeurs, climatisation, bureau, et bien plus encore. Grâce au vaste éventail de loisirs proposé par l'hôtel, les hôtes ne manqueront pas d'activités durant leur séjour. 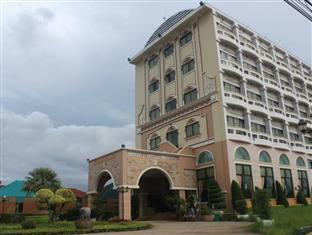 Grâce à un emplacement exceptionnel et des équipements hors pair, le Phitsanulok Orchid Hotel vise juste sur tous les points. Beaucoup de bruit du a la circulation mais on avait une chambre au 5 eme étage donc ca a limité les degats.chambre spacieuse malgre une tapisserie tres vieillotte. Je n‘ai pas encore trouvé mieux pour ce prix là! Bien sûr il y a deux légers bémols: 1)Personne ne parle anglais hormis pour dire les prix bien sûr, si non difficile difficile! 2)Hôtel excentré (3kms du Wat Phra Si Ratana Mahathat et bcp plus du reste) d‘où le prix pour cette qualité je pense. Si vous êtes à pieds, à moins d‘aimer marcher sous 40°c à l‘ombre, négociation obligatoire avec ces bandits de tuktuk. Si vous êtes motorisés ce sera parfait . We booked the hotel for two nights but stayed only one as our plan changed. We waited one hour for a simple American breakfast. The room was very nice and clean. Rooms were fairly clean, comfortable, and spacious. We were able to get a room with two double beds for 4 people total, which made it quite affordable. The place is a little neglected, but overall fairly nice. The location is not far from the train station, which worked well for us, but is not near many other places of interest. We were on the way to Surin, where the hotel was cheaper and lots nicer, so I'm biased now, but the room was fine. It's hardly a suite. Just two alcoves with no separating door, and one bathroom, reasonably clean, and perfectly OK for a budget stay. I think it would actually been cheaper to get two rooms, and thus two baths. We only had to sleep, when you don't have a thai with you don't go there, they don't speak english and the breakfast was only soup or fried rice. This was a typical Thai Hotel. No washclothes in the bathroom, no hand towels, no tub, even in the one bedroom suite, which by the way is no suite. It had a new air conditioner which was pleasantly cold, but other than that the stay was not pleasant. The breakfast area is non air conditioned, and it is either Thai fried rice, or Rice gruel soup. We will not stay again. Aircon worked well, room was clean. I stayed overnight traveling. For me it was just a place to spend the night and move on. I was happy with everything. Evening check in staff didn't have much English skills, but it worked out Fine. Two of the morning staff had excellent English skills and made the breakfast much easier. A Thai breakfast was readily available as was coffee. I wasn't interested in the Thai breakfast so I received some toast and jam. There was no adequate answer for "what would you recommend the city of Phitsanulok for"... so I answered skiing. I hope you get a chuckle from that. I will be back through Phitsanulok on my way back and will stay here overnight again. The staff was friendly. The room was clean and comfortable. This was a great comfortable, clean hotel to stay at. The staff were very helpful too. The only downfalls were the bathroom. There is no shower curtain in the tub. Also, depending what room you stay in the shower head may or may not reach your height. I'm 5'7 and one of the rooms we stayed in the shower head did not extend high enough to stand up while taking a shower. Other than this, the hotel was very nice. The employee were friendly and good services. I could see the view of town. Its easy to find the hotel and food is good as well. limpio, con aire acondicionado, comodo, nuevo y a muy buen precio. El servicio en general muy bueno, un poco alejado de la estacion de trenes. Personal kann kein Wort englisch. Wir mussten versuchen mit dem Google Translater zu kommunizieren was auch nich immer so geklappt hat. Frühstück war ganz ok. Das Hotel ist ca. 3km vom Zentrum entfernt. Tiptop,sehr angenehmer Aufenthalt, grosser Flachbildschirm TV mit vielen Kanälen, gutes Klimagerät, ältere aber gut isolierte Zimmer. mit eigenem Fahrzeug ein empfehlenswertes Hotel.